The Kranzler coffee house is an icon of west Berlin’s Kaffee Kultur. 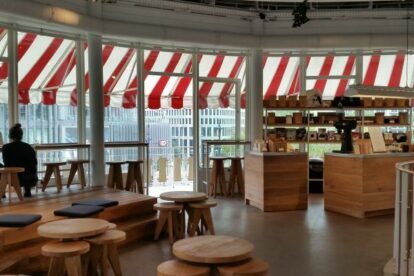 Sitting on the rooftop of the Ku’damm Superdry store, it hosts the well-known local coffee-roasting house The Barn, offering a good view over the busiest boulevard in the city with a large balcony and a south-facing rooftop terrace to enjoy sunny days. As with any purist rum or whiskey lover mixing their elixir with ice or water is more than a sin, when it comes to coffee you can speak with a cafeliers in terms of the fragrance of its powder and its aroma when diluted in water, its acidity, balance, body, color, cleanliness, sweetness and aftertaste. Note that there is no milk, Bailey’s or any other ingredient involved. Nevertheless, they do have milk and won’t throw you out of the store if you ask for it. The Barn works closely with coffee farms to slow them down in order to produce the best beans in their regions. And then the beans are roasted in the light Nordic style, which brings out all the flavors of the ripe coffee berry to avoid the ashy roast flavor common in darker coffees. Without being a coffee fan, I can tell that this coffee has a fruity taste I hadn’t experienced before.